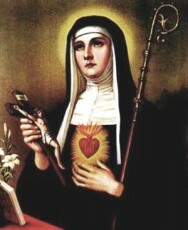 St. Gertrude is also known as Gertrude the Great, and was born on January 6th, 1256. She was a German Benedictine mystic, and theologian. It is assumed that she was an orphan, as nothing is known of her parents. She joined the Benedictine monastery of St. Mary at Helfta, as a young girl. She dedicated herself to her studies becoming an expert in literature and philosophy. She later experienced a conversion to God and began to strive for perfection in her religious life, devoting her talents to the study of Scripture and Theology. She had numerous writings, but only the “Herald of God’s Loving-Kindness” formerly known as her “Life and Revelations” and the “Spiritual Exercises” remain today. She had many mystical experiences, including a vision of Jesus, who invited her to rest her head on his breast to hear the beating of his heart, and the piercing of her heart with Divine love. Eternal Father, I offer Thee the most Precious Blood of Thy Divine Son, Jesus Christ, in union with the Masses said throughout the world today, for all the Holy Souls in Purgatory, for sinners everywhere, for sinners in the Universal Church, for those in my own home, and within my family. Amen. St. Gertrude was an orphan child that entered the Benedictine Monastery at an early age. She had an intense conversion, when Jesus appeared to her, and invited her to listen to his heartbeat. She was a mystic that had a strong devotion to the poor souls in purgatory, and received a prayer that could be said in an effort to release souls. Christ promised to release a thousand souls from purgatory each time it was said, and the prayer was extended to include living sinners as well. This prayer is very popular to this day, nearly 8 centuries later.